Looking for that perfect gift for those special members of your wedding party? 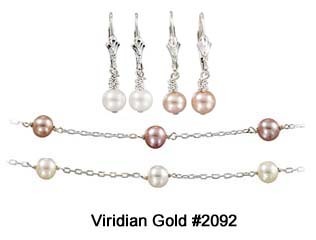 At Viridian Gold, we are pleased to offer a selection of gifts to honor your bridesmaids, maid of honor, best man and groomsmen. Make your selection from affordable items of pearl jewelry, sterling silver jewelry, and non-jewelry gifts, such as small jewelry cases. For pearl gifts, we suggest our Freshwater Pearl Station Necklace and Earring Set #2092, pictured on the left, or our Pearl Bracelet #3036, which is available in six, pearl color combinations. For sterling silver bridesmaids' gifts, two of our most popular items are designer Deborah Birdoes' Friendship Heart Necklace #2064 and our Sterling Silver Diamond Heart Locket #5168. 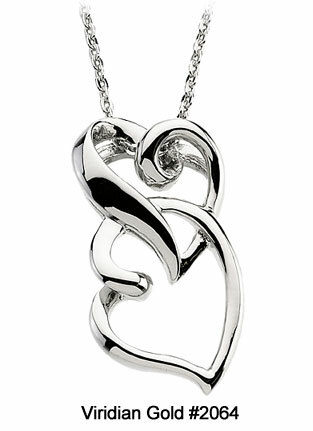 You may also choose from a selection of sterling silver necklaces, bracelets and earrings. our CZ Drop Earring and Necklace Set #2179. And don't forget to check out our Bridesmaids' Gifts page for even more suggestions, including small jewelry boxes and jewelry travel bags. Cross Pendants also make memorable, wedding party gifts for both bridesmaids and groomsmen ~ choose from a selection of both men's and women's crosses in sterling silver and stainless steel. For men, may we suggest an engravable money clip, such as our Sterling Silver Money Clip #9055, or a pair of men's cuff links, such as our Titanium Cuff Links #9086. As always, if you need assistance with your selection, please give us a call ~ we're always happy to help!